Scoot has unveiled plans to launch service to Perth, which will become the Singapore Airlines long-haul low-cost subsidiary’s 12th and final destination to be served as part of its initial six-aircraft 777-200 operation. Scoot has quickly expanded since launching in Jun-2012 but after placing into service its sixth 777 in Nov-2013 will take a one-year hiatus from expanding until its first of 20 787s arrive in late 2014. In an unusual but logical move, Scoot has decided to lease its sixth 777 from SIA and keep the aircraft in SIA configuration. This enables the carrier to save on retrofit costs but will lead to higher per seat costs until the aircraft is replaced with a 787-8 in 2015. Scoot has emerged as an important tool to expand SIA’s already leading presence in the key markets of Australia and Greater China. Perth will be Scoot’s third Australian destination while its other previously announced new upcoming destination, Hong Kong, will be Scoot’s sixth destination in Greater China. The carrier also serves Bangkok, Seoul and Tokyo. Scoot announced on 16-Oct-2013 that it will begin serving Perth on 19-Dec-2013 with five weekly flights from its Singapore hub. Sydney and Gold Coast were the carrier’s first two destinations. Sydney is served daily and Gold Coast is served with five weekly flights. The addition of Perth will give Scoot 6,834 weekly seats to Australia, making it the third largest carrier in the Singapore-Australia market with almost a 10% share as of late Dec-2013. Singapore Airlines, which serves five destinations in Australia including Perth and Sydney, will account for a 51% share. When also including the group’s other two brands, regional full-service subsidiary SilkAir and short-haul low-cost affiliate Tigerair, the SIA Group will have nearly a two-thirds share of capacity in the Singapore-Australia market by the end of 2013. SIA’s four brands combined will have about 47,500 weekly seats to Australia in late Dec-2013, representing about a 35% increase compared to Dec-2011. Scoot has accounted for over half of this increase. SIA mainline growth to Australia has accounted for most of the other growth with the launch of services to Australia by SilkAir, which now serves Darwin with four weekly flights, accounting for a small fraction. In addition to the establishment of Scoot, the forging of an extensive partnership with Virgin Australia has helped drive growth for SIA in Australia. While Virgin Australia does not serve Singapore, it supports SIA and SilkAir sales in Australia through a codeshare and provides important feed from secondary Australian cities not served by SIA. The Qantas Group, including Australian-based LCC Jetstar Airways and Singapore-based LCC Jetstar Asia, will account for only about 22% of capacity in the Singapore-Australia market as of late Dec-2013. 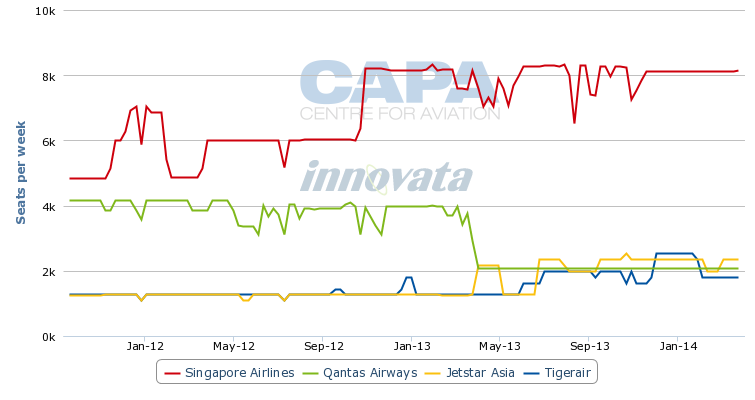 The Qantas Group has seen its share slip significantly, down from about a 32% share of capacity in Dec-2011. This has been driven partly by the SIA and Scoot expansion and partly by Qantas moving the stopover of its European flights from Singapore to Dubai. The 10ppt decline in Qantas’ capacity share is slightly misleading because about half of Qantas’ Australia-Singapore passengers flew onto Europe before the carrier dropped Singapore-Frankfurt and switched its two daily Singapore-London flights to Dubai-London earlier this year. 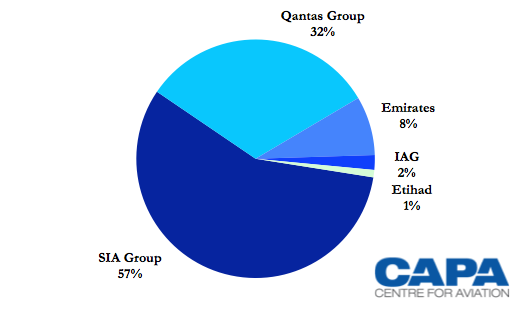 New Qantas partner Emirates accounts for another 7% of seat capacity in the Singapore-Australia market, giving the Qantas and Emirates combination (including Jetstar) a 29% share. Emirates, which links Singapore with Brisbane and Melbourne, has a much bigger presence in the market than Qantas’ former partner British Airways, which continues to link Singapore and Sydney but with a smaller aircraft. BA and Etihad, which serves the Singapore-Brisbane route, now each account for slightly more than a 2% share of capacity in the Singapore-Australia market. Australia is a key market from Singapore Changi, accounting for about 10% of the airport’s total capacity. Only neighbouring Indonesia and Malaysia currently have more capacity from Changi. Australia also has always been a key market for SIA. Australia accounts for more SIA mainline seat capacity, about 15%, than any other country. Scoot’s ability to bring into the SIA Group a new segment of the Singapore-Australia market is an important component of the group’s new multi-brand strategy. Previously Jetstar and AirAsia catered for the bottom end of the Singapore-Australia market. Jetstar Airways/Jetstar Asia offer non-stop flights from Singapore to Darwin, Melbourne and Perth from Singapore while AirAsia/AirAsia X offer one-stop connections to Adelaide, Gold Coast, Melbourne, Perth and Sydney via Kuala Lumpur. Perth also has traditionally been an important destination for Singapore Changi and the SIA Group. The new Scoot flight will make Perth one of the top 10 routes from Singapore based on seat capacity. Singapore is already the largest international route from Perth. While Perth is a relatively small city, there is a large Singapore community in the Perth area. Singapore is also geographically well positioned to handle international traffic from Perth to destinations throughout Asia as well as Europe and to some extent North America. SIA is already the market leader in the Singapore-Perth market, with four daily 777 flights accounting for about a 57% share of capacity. Qantas currently only has one daily A330-300 flight, having dropped its second daily frequency at the end of Mar-2013 as it cut connections in Singapore to London and Frankfurt. Sister carrier Jetstar Asia has partially filled this void by adding six weekly frequencies, giving it a total of 13. Tigerair Singapore currently serves Perth with nine to 10 weekly frequencies but will offer a double daily service from the end of Nov-2013. 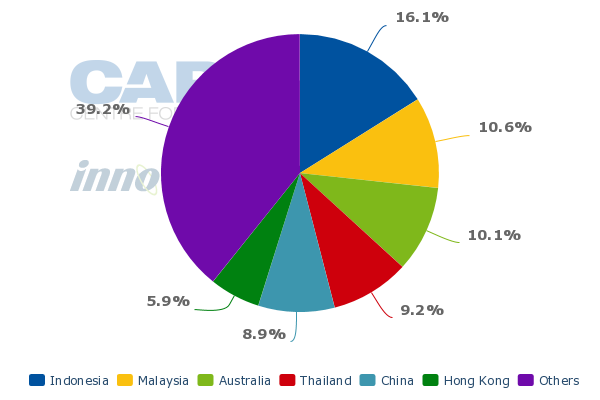 Scoot will capture from late Dec-2013 about a 12% share of total capacity in the Singapore-Perth market, giving it only a slightly lower share than Tigerair, Jetstar and Qantas. The Scoot, SIA and Tigerair brands will give the SIA Group a combined 74% share of capacity on the route as of late Dec-2013 compared to only 26% for the Qantas Group. 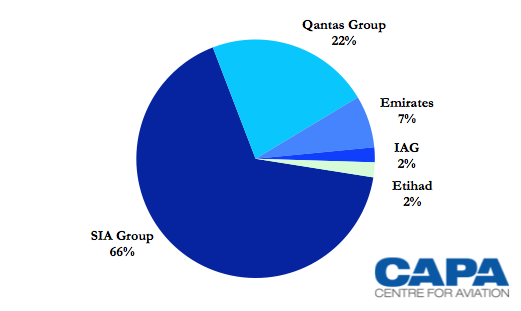 In Dec-2011, the SIA Group had a 64% share while the Qantas Group had a 36% share. While Scoot will be the third LCC in the market it will have a significant cost advantage over the other two LCCs as they operate A320s on the route. Perth-Singapore is about a five hour flight. While it is within range of A320s, such long flights for narrowbody LCC operators come with a cost penalty compared to shorter flights. Narrowbody LCCs generally prefer to stick to flights of four hours or less for this reason. If Scoot can fill its 777-200s it will have a much lower cost per passenger than Tigerair or Jetstar. The local Singapore-Perth market should be large enough to enable high load factors on 400-seat aircraft, particularly if Scoot is able to stimulate the market by using its seat cost advantage to bring in lower fares. Scoot will also offer connections in Singapore for Perth passengers, which will help it achieve higher load factors. Connections to other Scoot destinations, particularly Hong Kong, as well as to Tigerair and SIA/SilkAir destinations throughout Asia will be available. Hong Kong-Perth could be a particularly attractive market as Qantas dropped non-stop flights on the route earlier this year, leaving only Cathay Pacific with non-stops. Scoot will not be the only LCC to offer one-stops in the Hong Kong-Perth market. Jetstar and Tigerair are also able to offer Hong Kong-Perth connections via Singapore. But Scoot's widebody operation gives it a lower cost and its schedule will be attractive with quick connections in both directions. Greater China has been the other main market in which the SIA Group has used Scoot to boost its presence. Scoot operates alongside SIA on Singapore-Taipei and will operate alongside SIA on Singapore-Hong Kong from 15-Nov-2013. In mainland China Scoot has been used to open new secondary markets that would not be viable for SIA mainline. The group prefers to avoid having the SIA and Scoot brands operate side by side in mainland China as it does or will do from Singapore to Sydney, Perth, Bangkok, Hong Kong and Taipei. Seoul Incheon and Tokyo Narita are also served by both brands but Scoot serves these airports via Taipei and therefore differentiates its product by providing a one-stop service while SIA offers non-stops. Scoot now serves four destinations in northeast China – Nanjing, Tianjin, Qingdao and Shenyang. Scoot accounts for about 6% of seat capacity in the Singapore-China market. Scoot, along with expansion from Tigerair and SilkAir, have driven an increase in overall SIA Group capacity share in the Singapore-China market from 48% in Dec-2011 to 56% in Dec-2013, according to CAPA and Innovata data. Scoot now operates four weekly flights to Tianjin but will reduce this service to three weekly flights from Oct-2013. Scoot sees the Tianjin reduction as seasonal and expects at some point to go back to four weekly frequencies. Nanjing is currently served with three weekly flights but Scoot plans to add a fourth flight from Oct-2013. Qingdao and Shenyang are tagged with three weekly flights on a Singapore-Qingdao-Shenyang-Qingdao-Singapore routing. Scoot plans to add a fourth weekly flight on this route from Nov-2013. But the increases in the Nanjing, Qingdao and Shenyang markets will be offset by the switch from 402-seat 777s to 323-seat 777s on most Nanjing and Qingdao/Shenyang flights. As a result total capacity to Nanjing and Qingdao/Shenyang will only increase marginally despite the addition of the fourth frequency. Scoot’s initial five 777-200s were acquired from SIA and retrofitted with 370 economy class seats and 32 recliner style business class seats. Scoot has decided to dry lease its sixth 777-200 for a period of about 18 months, at which point it will be replaced with a 787-8. The 777 Scoot is leasing from SIA will still have in-flight entertainment monitors at every seat but Scoot will not turn on the systems. Instead it will sell pre-loaded iPads. Scoot has a wireless IFE product available for sale on the five 777-200s it has retrofitted. Scoot will only use the leased SIA 777-200 on the Nanjing and Qingdao/Shenyang route as these destinations are not served by SIA. The other destinations in the Scoot network are served by SIA or are near SIA destinations – as in the case of Gold Coast (near Brisbane) and Tianjin (near Beijing). Using the SIA-configured aircraft to SIA destinations would fail to sufficiently differentiate the SIA and Scoot products in these markets. The two routes Scoot will use the SIA 777 for are also thin routes in which Scoot has not typically been able to fill all 402 seats. Scoot is not losing much, if anything, by offering just 323 seats for Nanjing and Qingdao/Shenyang. The ideal aircraft for these routes are the smaller 787-8. Scoot is committed to acquiring 20 787s, having taken over in late 2012 SIA’s original order for 20 787-9s. Scoot has since adjusted this order to include 10 787-9s and 10 smaller 787-8s. The 787-9s will have a seating capacity that is only approximately 5% less than Scoot’s 777-200s but will come with a projected 27% reduction in per seat fuel costs. The 787-8s will have about 20% fewer seats than the 777-200, allowing Scoot to improve profitability in its smaller markets such as Nanjing and Qingdao/Shenyang and launch new routes to secondary destinations which would not be viable with its 777 fleet. Scoot is particularly bullish on further growing its Chinese network after it takes delivery of the 787-8 as the type is the ideal aircraft for opening routes to secondary Chinese destinations given its smaller seat capacity and efficiencies. Scoot is currently evaluating more potential destinations in northeast China as well as possible destinations in central China such as Xian. Western China is also an area of interest but not for the short to medium term as destinations in the remote western parts of China need to develop further before widebody flights to Singapore would be viable. Southern China is not on Scoot’s radar as this is within the range of A320s operated by sister carrier Tigerair. An opportunity to further grow the Chinese network will come in 4Q2013 (calendar year) when Scoot takes its first 787, a 787-9. One more 787-9 will be added in 1Q2014 (calendar year). Scoot has allocated these initial two 787s as growth aircraft, allowing it to catch up on growth after having one year without any capacity expansion. Scoot’s original fleet plan envisioned a fleet of 14 777s by mid-2016. The carrier’s original growth projections are still on track with Scoot now planning to operate 14 787s by about mid-2016. But there will be a slower than originally planned ramp up in 2014 followed by a faster than originally planned ramp up in 2015. This is due to the transition to the 787s, which were not part of the original business plan. Scoot’s original fleet plan envisioned two aircraft being added in 2014 for a total of eight 777s by mid-2014. Scoot will now have only six 777s in mid-2014. But the original plan had only three aircraft being added in 2015 followed by two more in 1H2016. Scoot will now expand at a faster clip over this period. The transition to the 787s will improve Scoot’s costs significantly and should help make the carrier become profitable. With the higher cost 777s and a relatively small fleet of six aircraft, profits are not expected until the transition to the 787s. With the cash-rich SIA Group its sole owner, Scoot has the luxury of focusing on perfecting its model and network rather than face a burning need to be immediately profitable. Despite not having the ideal aircraft type for long-haul low-cost operations, Scoot has been able to make a significant mark in the Singapore and wider Asia-Pacific markets. Its initial network of 12 destinations (excludes Singapore) has added value and market share for the SIA Group at a critical juncture when competition, particularly from LCCs, is intensifying. By the end of this year Scoot will provide about 49,000 weekly seats, including almost 41,000 in the Singapore market (the other 8,000 seats are provided between Taiwan and Japan or South Korean). This will give Scoot almost a 3% share of capacity in Singapore and almost a 9% share of LCC capacity at Changi. While these figures are not huge, they open up an entirely new market segment for the SIA Group, allowing the group to boost its overall share of capacity in Singapore to about 53%. This includes a projected 11% share for Tigerair and its affiliates, a 32% share for SIA mainline and an 8% share for SilkAir, based on capacity data for Dec-2013. More importantly Scoot has allowed SIA to significantly boost its presence in the key markets of Australia and Greater China. The upcoming launch of services to Perth and Hong Kong is yet another example of Scoot unlocking new growth for SIA in those regions. The 787s, once they start to arrive in late 2014, will drive another phase of growth in these markets, as well as some others, for Scoot and the SIA Group. The new fleet of 787s should also lead to profitability for Scoot and prove that SIA made the right decision in bravely deciding to enter the emerging long-haul low-cost sector.